Glo bars are high in protein with lots of fiber and only 2-5 g of sugar per bar! Glo and look your best with plant based, health supportive ingredients! Always 100% vegan, gluten free, non-GMO and kosher and free from preservatives, soy protein isolates, whey, grains, and sugar alcohols. Raw Rev Basic Superfood Blend (Raw Cashews, Pea Protein, Organic Brown Rice Protein, Raw Organic Hemp Protein, Raw Organic Virgin Coconut Oil, Raw Organic Chia Seeds, Raw Organic Sprouted Flax Seeds), Isomalto-Oligosaccharides (Prebiotic Fiber from Tapioca), Organic Italian Dark Chocolate Chips (Cane Sugar, Chocolate Liquor, Cocoa Butter, Soy Lecithin, Vanilla Extract), Natural Flavors, Sea Salt. Contains Tree Nuts, Soy and Coconut. May contain shell and pit fragments. May be manufactured on machinery that also processes peanuts, milk, eggs and wheat. Note: We are unable to offer Paypal as a payment option for orders containing this product. If you're craving cookie dough, just go for the real thing. Weird taste. Not at all reminiscent of cookie dough. This product is awesome. healthy ingredients and no compromise on taste. Very good tasting bars! 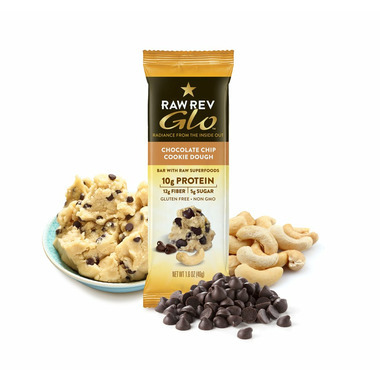 Not exactly like raw cookie dough but the closest of any bar I've tried and especially when you get a bite that includes some chocolate chip. It definitely tastes low sugar which I much prefer. I'm glad some companies are finally adding less sweetness! My favorite flavour! I was really intrigued when I read the ingredients list, but a bit put off by the packaging. I doubted anything with such wholesome ingredients and so little sugar could actually be tasty but it was! These bars are now my favourite snack between work and hot yoga.